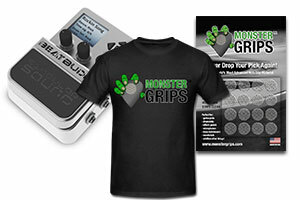 Monster Grips: The Ultimate Grip for Guitar Picks and More! Never drop your pick again! The Ultimate Super Grippy, Non-Sticky, Silicone Grip! Monster Grips® is a revolutionary, silicone grip that easily applies to your guitar picks, drum sticks, effects pedals, equipment, and more! You've tried all the messy products. Now put a clean end to slips with the great feel and hold of Monster Grips™. Works great on guitar picks, pedals, drumsticks, microphones, wind instruments, and more! Share your amazement with your friends! Take advantage of the Super Grippy, Non-Sticky, Silicone Grip that is Ultra Thin, and stays Clean. This product is just amazing. No more flying picks :). I have already recommended to my entourage and the response has been great. Just a great idea at a great price, even in Canadian dollars. And Customer service is no. 1 as well. Thanks. – Guy C.
Have you ever seen a the guitarist at a rock concert smash his sweet guitar at the end of a set? It’s because he dropped his pick. I absolutely love this product. When I play hard I used to drop my pick or have to readjust it in the middle of a song. No more. The other thing I love is that it can stick to my guitar. I like to pluck and use a pick in the same song, and now I don’t have to hold it in my mouth and sing. I just stick it to the edge where I can easily grab it. I wish this product was around when I started playing. – Sid E.
Just received my pack of grips here in the UK. What can I say – awesome!!! Easy to use and does exactly what it says on the tin. Grippy but not sticky. Much better than gorilla snot and the like. Will definitely be getting some more. – Jon H.
Don’t even have a guitar, still love these things. Small little ultra grippy stickers for use on my phone and camera. No more slipping! – David B. Be The Next Amazed Customer! Is your band playing at a large event? We would love to hear about it, so please fill out our request form. We are often asked if we are carried locally, so join the growing list of distributors today! Inquire Today! Enter your information to be entered into a drawing for free gear, plus receive coupon and sales announcements! Close. I don't like awesome things.